Tuning the people/process/info stack for better sales, marketing, service. Should you accept a LinkedIn request from a stranger? Some legitimate, real people (but also a few spammers, trolls and competitors) send LinkedIn invitations to complete strangers. I extend the term “stranger” to include belonging to the same LinkedIn Discussion Group but not having had any substantive dialogue or value exchange. Should you link to them? Okay for some, but not for me. Here’s why. Allies – Domain experts whom I know well, and who add perspective. This means we’ve met, collaborated and significantly influenced one another’s lives; maybe a customer, partner, supplier, or coworker. Acquaintances – non-allies with whom I have actively exchanged value in the form of work, knowledge or perspective. Merely belonging to the same LinkedIn group without jointly participating in that group’s dialogue does not qualify. Colleagues, Collaborators, Clients – anyone with whom I’ve had substantial business experience from which I can discern their ethical behavior. Okay, Stranger, I’m off my horse now and indeed looking forward to starting or joining a dialogue as a part of getting to know you – especially if we share a LinkedIn Group or two, where the chances are thus quite good. 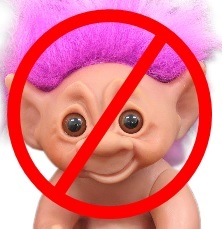 But don’t get me started back on the subject of Trolls. We both know they exist. Heck, if you are sending me – a total stranger – a LinkedIn invitation, aren’t you risking it a bit? I could be that Troll. Of course I’m not; I’m just saying. It’s actually pretty easy to spot a Troll even though the more sophisticated ones create entire fake Company profiles on LinkedIn, complete with fake recommendations and group memberships. Dig a little deeper, though, and you may see telltale “cardboard cutout” signs: no active Group participation, no traceable business listing. Oh, yes, and some of these fake profiles are sending LinkedIn invitations to strangers like you. Why would a Troll go to all the bother? To leverage the trust between you and your network, gain access to your contacts, access and extract your network’s profile data, spam them and, in the process, quite possibly mar your reputation – and maybe deservedly so, if you’re that careless. Let’s look at how LinkedIn is used today in the corporate world. Recruiters searching for talent increasingly use LinkedIn to find candidates. Researchers and sales pros with legitimate needs use LinkedIn to search among their contacts and extended networks for knowledgeable references. If you appear in one of those search results, and the recruiter / researcher notices you are LinkedIn to a colleague at their company, or a relevant influential person: Bingo! Instant inferred trust and credibility, as if your reference check is already done and your credibility is established….unless you’re not really acquainted and just pecked the “Accept” button simply to amass more pointless, relatively anonymous Connections. If you are linked in to a bunch of strangers who either don’t know you or can’t remember you, imagine what that recruiter or researcher must think about the veracity of the rest of your LinkedIn profile – or your ability to discern, cultivate allies, and align resources. Do you want to be seen as trustworthy, honest and accurate in your communications? Well, then, don’t damage your credibility by linking to people you don’t know and, incidentally, dilute that critical Social Currency known as Trust by co-mingling untrustworthy strangers into your network of trusted associates. We CAN-SPAM compliant marketers know better. Relationships, trust and respect are hard-won and sacrosanct. You get what you give. Of course, if you don’t discriminate on LinkedIn between strangers and trusted relationships, then by all means, link away. Just don’t expect me to reciprocate until after we have established a mutual, credible dialogue. Until then, keep smiling. This entry was posted on Friday, June 21st, 2013 at 8:10 AM and is filed under Opinion, social media, Uncategorized. You can follow any responses to this entry through the RSS 2.0 feed. You can leave a response, or trackback from your own site. You Call That Artificial Intelligence? Analytics - Web, data, etc.